Salamandra algira. Ketama. Photo: © Juan Pablo González de la Vega. S. a. algira + ssp. Wouter Beukema (2015): Salamandra algira Bedriaga, 1883. In: Martínez, G., León, R., Jiménez-Robles, O., González De la Vega, J. P., Gabari, V., Rebollo, B., Sánchez-Tójar, A., Fernández-Cardenete, J. R., Gállego, J. (Eds.). Moroccoherps. Amphibians and Reptiles of Morocco and Western Sahara. Available from www.moroccoherps.com/en/ficha/Salamandra_algira/. Version 9/09/2015. Accessed 25 Apr 2019. English: North African Fire Salamander. Français: Salamandre Algire, Salamandre Tachetée. Global range map of Salamandra algira according to the IUCN. The first mention of the genus Salamandra in Morocco was made by Boulenger (1890), based on material originated from the ‘Benider Hills near Tanger’. Subsequent collectors could not verify this claim, which led to doubts on the actual presence of Salamandra in Morocco (e.g. Hediger, 1935 and references therein). By the mid-twentieth century however a considerable number of records had been published (Pasteur & Bons, 1959), although information on S. algira remained particularly scarce. Recent publications have provided detailed accounts of distribution, reproductive behaviour and updated taxonomy (Donaire-Barroso & Bogaerts, 2001; Donaire-Barroso et al. 2001; Bogaerts & Donaire-Barroso, 2003; Donaire-Barroso & Bogaerts, 2003; Bogaerts et al. 2007). Salamandra algira was divided into two subspecies by Donaire-Barroso and Bogaerts (2003), by separation of S. a. tingitana from the nominate S. a. algira. Escoriza et al. (2006) rediscovered S. algira in the northeast Moroccan Beni Snassen Massif, and subsequently described the population as S. a. spelaea based on mitochondrial and morphological evidence (Escoriza & Mar Comas, 2007). Populations in the Rif- and Middle Atlas mountains were attributed to S. a. splendens by Beukema et al. (2013). Both Bedriaga (1883) and Pasteur and Bons (1959) reported S. algira to be larvae-bearing. Hence, observations of populations which deposit fully-developed juveniles among the limestone outcrops in extreme north-western Morocco (Donaire-Barroso & Bogaerts 2001; Donaire-Barroso et al. 2001) were unexpected. Subsequent research showed that S. algira from northwestern Morocco consistently lack red discoloration while often showing white specks or rosettes on the underside. The northernmost populations were shown to possess a high tendency towards hypoluteism and melanism (Bogaerts & Donaire-Barroso 2003). As a result of the aforementioned characteristics, Donaire-Barroso and Bogaerts (2003) described S. a. tingitana. Recent studies have shown S. a. tingitana to possess a more extended distribution than initially thought, while mtDNA studies showed the taxon to consist of three clades which diverged during the Pleistocene (Beukema et al. 2010; Velo-Antón et al. 2014). Only the northernmost, Mediterranean-influenced clade deposits fully-developed juveniles, while populations located in the Atlantic-influenced triangle formed by Tetouan, Ksar el-Kébir and Chefchaouen deposit larvae (e.g. Velo-Antón et al. 2014). The boundary between these is approximately located near the Oued Martil, with larvae occasionally having been found west of Tetouan (D. Donaire-Barroso pers. obs. ), the southernmost population bearing fully-developed juveniles according to Beukema et al. (2010). As noted before, S. a. tingitana is characterized by a lack of red patches, as well as general presence of whitish flecks on the chin and underside of the body. Melanistic individual of Salamandra algira tingitana. Photo: © Philip de Pous. The difference between S. algira populations from the Moroccan Rif- and Atlas Mountains in respect to other populations of the same species was already mentioned by Steinfartz et al. (2000). Based on their allopatric distribution, genetic differentiation and distinct colour pattern Beukema et al. (2013) described these populations as S. a. splendens. Individuals of this subspecies are generally characterized by a combination of yellow and red patches. Especially in the Rif Mountains, the latter can overtake the number of yellow patches, making the individual look largely red. Whitish flecks are rarely present on the chin. Melhaoui and Chavanon (1989) were the first to report a finding of S. algira on Jbel Ouartass, south of Berkane in the Beni Snassen Massif. Due to the karstic nature of this massif and presence of S. algira across the Algerian border near Oran, Melhaoui and Chavanon (1989) presumed populations of Beni Snassen to have gone unnoticed due to their nocturnal behaviour, while expecting them to be more widely dispersed across the massif. Subsequently, no additional sightings were recorded for nearly two decades, after which Escoriza et al. (2006) rediscovered the presence of S. algira in the Beni Snassen Massif. A year later, Escoriza and Comas (2007) described this isolated population as S. a. spelaea. Individuals are characterized by large yellow patches in combination with lesser amounts of small red marks. Occasionally, white flecks are present on the underside. Male of Salamandra algira spelaea. Beni Snassen. 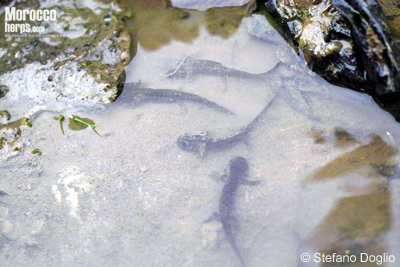 The activity of S. algira is limited to humid, rainy nights during which individuals come to the surface to forage and reproduce. During the day and outside of the activity season, S. algira stays hidden under logs, rocks or similar surface materials. The activity period of S. a. tingitana takes place in winter, while activity of the other S. algira populations is largely limited to spring and autumn, as these live at higher altitudes. Larvae of ovoviviparous populations are deposited in springs, brooks and ponds during autumn. Left: Larvae of Salamandra algira ssp.. Talassemtane National Park. Photo: © Stefano Doglio. Right: Salamandra algira tingitana, just metamorphosed. Rif. Photo: © Wouter Beukema. The occurrence of Salamandra algira in Morocco is limited to humid mountain ranges in the north and centre of the country. Generally, populations inhabit dense or open forests in the vicinity of streams or water sources consisting of Quercus, Abies and Pinus species as well as Olea europeana. These habitats are often characterized by an abundance of rocks and logs under which S. algira seeks shelter during the day. Viviparous populations of S. a. tingitana inhabit largely barren, karstic Mediterranean-faced mountain ranges of the Tingitana peninsula, partially overgrown by Mediterranean maquis. Ovoviviparous populations of this subspecies occupy similar habitats as S. a. spelaea and S. a. splendens. The latter subspecies occurs in the Rif- and Middle Atlas Mountains where it can reach high densities in suitable habitat. Salamandra algira spelaea has so far only been found between 600-1300 m in the Beni Snassen Massif, occupying limestone outcrops and granite soils within diverse types of forests that appear between these altitu­dinal ranges, often close to water bodies. Habitat of Salamandra algira tingitana. Rif. Habitat of Salamandra algira spelaea. Beni Snassen Massif. Beukema, W., De Pous, P., Donaire, D., Escoriza, D., Bogaerts, S., Toxopeus, A.G., De Bie, C.A.J.M., Roca, J. & Carranza, S. 2010. Biogeography and contemporary climatic differentation among Moroccan Salamandra algira. Biological Journal of the Linnean Society, 101: 626–641. Bogaerts, S. & Donaire-Barroso, D. 2003. Sobre el politipismo en Salamandra algira Bedriaga, 1883. Boletín de la Asociación Herpetológica Española, 14: 47–51. Bogaerts, S., Valkenburg, K., Donaire-Barroso, D. &Espallargas, G. 2007. New localities of the North African fire salamander (Salamandraalgira) at the southern limit of it’s distribution in Morocco. ZeitschriftfürFeldherpetologie, 14: 238–241. Boulenger, G.A. 1890. Catalogue of the Reptiles and Batrachians of Barbary (Morocco, Algeria, Tunisia) based chiefly upon the Notes and Collections made in 1880-1884 by M. Fernand Lataste. Transitions of the Zoological Society of London, 13: 93–164. Donaire-Barroso D. & Bogaerts S. 2001. 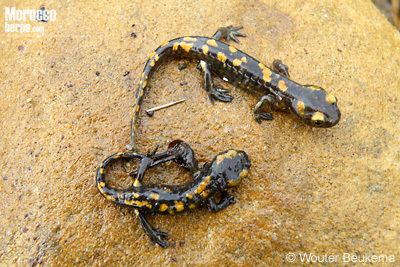 Observations on viviparity of Salamandraalgirain North Morocco. In: Lymberakis, P., Valakos, E., Pafilis, P. & Mylonas, M. (eds), Herpetologica Candiana. Natural History Museum of Crete, Irakleio, Crete, pp. 147–151. Donaire-Barroso, D., Bogaerts, S. & Herbert, D. 2001. 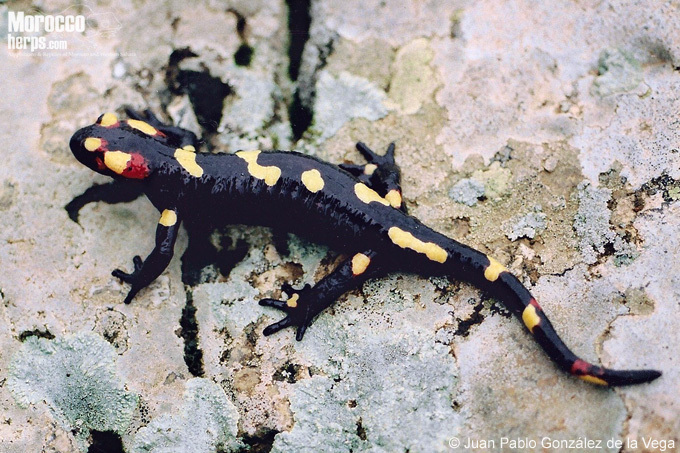 Confirmación de desarrollo larvario completo intrauterino en Salamandra algira (Bedriaga, 1883) del Noroeste de Marruecos. Butlletí de la Societat Catalana d’Herpetologia, 5: 107–110. Donaire-Barroso, D. & Bogaerts, S. 2003. A new subspecies of Salamandraalgira Bedriaga, 1883 from northern Morocco. Podarcis, 4: 84–100. Hediger, H. 1935. Herpetologische Beobachtungen in Marokko. Verhandlungen der Naturforschenden Gesellschaft in Basel, 46: 30–31. Pasteur, G. & Bons, J. 1959. Les Batraciens du Maroc. Travaux de l'Institut Scientifique Chérifien, Serie Zoologique, Rabat, 241 pp. Steinfartz, S., Veith, M. & Tautz, D. 2000. Mitochondrial sequence analysis of Salamandra taxa suggests old splits of major lineages and postglacial recolonization of Central Europe from distinct source populations of S. salamandra. Molecular Ecology, 9: 397-410.